Strong globalization puts the chemical industries under increasing competitive and cost pressures. Variations in raw material quality require maximum production flexibility. Furthermore, growing environmental awareness calls for implementation of radical measures. And still a consistently high product quality is expected and essential for a company’s survival. Characterized by a large variety of processes, few of the chemical industries are exactly alike. With our extensive know-how and involvement in both unit operations and processes, we have developed solutions that enable our customers to remain competitive. From storage and raw material preparation to end product and waste treatment, our instruments and analyzers play a role of ever increasing importance. Competitive pressures and increasing customer demand mean you never stop looking for ways to raise productivity, improve efficiency, and cut costs. At METTLER TOLEDO we never stop looking for ways to help you achieve these goals. 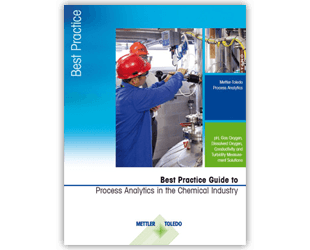 This guide contains a collection of success stories from a few of our many chemical and petrochemical customers. It highlights different analytical measurement challenges they faced, and how METTLER TOLEDO solutions provided the answer. Both in batch and continuous operations where a pH, ORP, turbidity or conductivity value is critical, only real-time in-line analyses of these parameters enable fast and direct response process control; maximizing product quality, consistency, yield as well as safety. Processes that take place in gas phase are optimized and run safely with the use of in situ gas analysis based on tunable diode laser spectrometers with the smallest footprint available in the industry. Neutralization of acidic or alkaline process media and waste is common throughout industries and in applications. 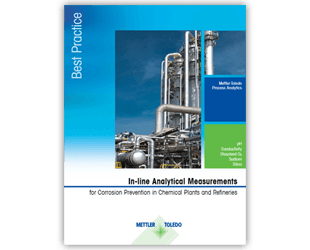 Whether in sour petrochemical processes and pulp and paper or in hydro-metallurgical applications in mining, measurements from robust process-resistant pH sensors ensure accurate control during these processes safeguarding yield, product quality and equipment integrity. Cooling water systems are vulnerable to corrosion, scaling and biological contamination,and through continuous evaporation the concentration of impurities increases over time. 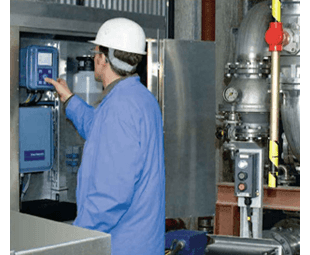 A good water treatment program, maintaining ideal pH, ORP and conductivity levels, helps to control the water quality and to maximize the number of cooling water cycles without compromising human health or the integrity of heat exchangers and piping. Find out how much time and money you can save by switching to Intelligent Sensor Management (ISM®).